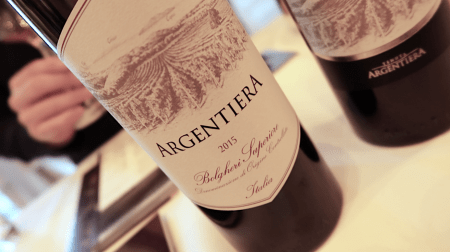 In December of 2018, we attended James Suckling Great Wines of Italy Hong Kong, an event that we had been looking forward to for a long time. The Hong Kong event was the second stop on the James Suckling Great Wines of Italy Tour Asia 2018, which also included Beijing (China), Bangkok & Phuket (Thailand). It’s one of four themed events by James Suckling which includes Great Wines of the World, Great Wines of the Andes, and Bordeaux Confidential. James Suckling is quite a polarizing figure in the wine industry. He was at the Wine Spectator for nearly thirty years and now runs his own platform www.jamessuckling.com. Some people trust his tasting notes while many dislike him. Regardless of what you think of him, he churns out a massive amount of reviews, videos, and live events. Like him or loathe him, Suckling gets many outstanding producers together in one room, pouring great wines to the crowd. The Great Wines of Italy Hong Kong saw 97 producers pouring nearly 200 wines over three hours. There were giants present like Antinori all the way down to smaller producers like Bruno Giacosa. James Sucking Great Wines of Italy Hong Kong 2018 was well presented and impeccably organized. We were amazed by the layout and handouts. All the wineries were organized by appellation and numbered appropriately The handout listed each wine poured by producer including vintage and the score by James Suckling. Because of the crowd, we didn’t get a chance to taste every wine (although we definitely tried). Here were our favorites from the event. We’re no strangers to Cantina Terlano, they may be our favorite cooperative winery in the world. They produce stellar wines at every price point and their mid-range and reserve labels are incredible. Charine found herself wowed by the newest release of the Nova Domus Terlaner Riserva. Pio Cesare is one of the big names in Piedmont and their Il Bricco de Treiso Barbaresco is a killer single vineyard effort. It’s another fine example of what makes Nebbiolo so special. “100% Sangiovese from a certified-organic vineyard at 500 meters above sea level. The soil types are a mix of limestone and clay, and the average age of the vines is 45 years old. The grapes are crushed by foot and fermented in a mix of open-top bins and cement tanks. There was a bit of stem inclusion used in fermentation, and the wine was aged in barriques for more than 2 years before bottling. The Tenuta San Guido Sassicaia is an iconic Italian wine and was one of the original Super Tuscans. In the past, I haven’t been huge on this wine. I respect that quality, but it just hasn’t got me that excited. 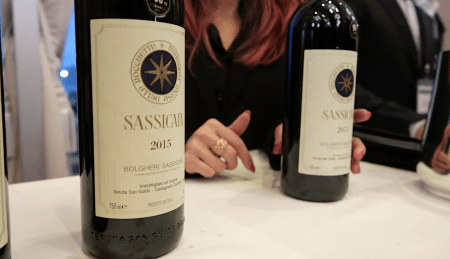 The 2015 Sassicaia was named Wine Spectator’s top wine of 2018, which only adds to the hype. Charine is a huge fan of Brunello di Montalcino and we made sure to taste as many as possible. 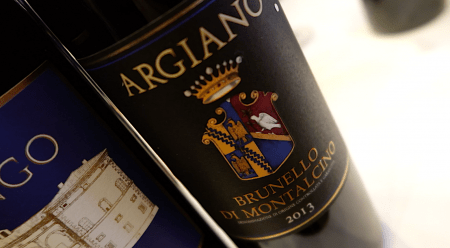 This Argiano Brunello di Montalcino 2013 was our favorite of the event. It’s not the Brunello producer with the biggest name or the highest price point, but it’s a fantastic wine. We spend a lot of time in Friuli-Venezia Giulia but have yet to visit Schiopetto. 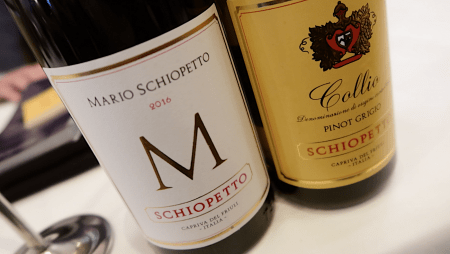 Mario Schiopetto is one of the pioneers in the region, introducing temperature control to create precise white wines. The winery has changed ownership and has decided to create an ode to Mario. Bruno Giacosa is a legend in Barolo and Barbaresco. Unfortunately, he passed away last January. By the time we got to the table, all of the bottles were empty. Just a few nights later, Charine met up with a friend in Hong Kong who ironically brought a Bruno Giacosa Barbaresco Santo Stefano 2007. Thanks to the team at James Suckling for providing us with trade passes for Great Wines of Italy Hong Kong. Please note that the opinions expressed are our own and have not been paid for in any way. We do not sell editorial content as that would destroy the legitimacy of our reviews and the trust between Exotic Wine Travel and its readers. On occasion, we extend the option of purchasing the wines we review or/and the products we spotlight. Some of these product links are set up through affiliate programs, which means Exotic Wine Travel gets referral credits if you choose to purchase these items via the links we provide.